As skin ages, cell turnover slows, the skin’s matrix thins, and pigmentation becomes more noticeable. Common complaints include fine lines, wrinkles, hyper-pigmentation and sagging of the skin. NeoStrata Pro System peels provide anti-aging benefits across all skin layers. Exfoliation of the surface layers enhances cell renewal and pigment evening to improve skin clarity and the appearance of hyper-pigmentation. A series of peels helps provide anti-aging and textural benefits including reduced appearance of fine lines and wrinkles. NeoStrata ProSystem peels can be safely used on skin of color. 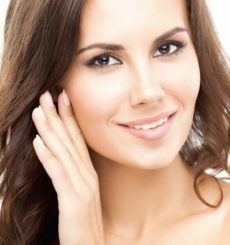 The uses, benefits, and safety of Glycolic Acid peels on skin of color have been widely published in literature. In addition to exfoliation and enhanced cell renewal, Alpha Hydroxy Acids, Glycolic and Citric Acids, can reduce the appearance of uneven pigmentation as well as provide antiaging textural benefits. NeoStrata ProSystem peels exfoliate the surface of skin helping to clear pores and provide a smooth complexion. 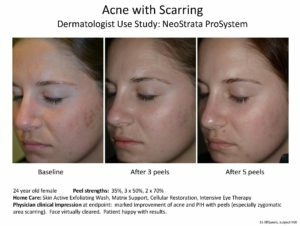 NeoStrata ProSystem peels also help to reduce the appearance of post-inflammatory hyperpigmentation and build the skin’s matrix to reduce fine lines and wrinkles. The NeoStrata ProSystem Clarifying Peel for oily/acne prone skin contains Mandelic Acid to target the sebum-rich skin of acne patients. Patients with sensitive skin can achieve antiaging and skin smoothing benefits from a series of NeoStrata ProSystem peels by starting with a low concentration and exposure time. 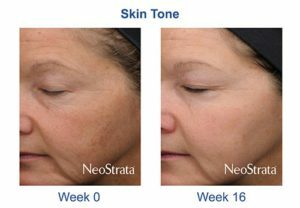 The NeoStrata ProSystem peels can also be used to provide adjunctive benefits to clinically sensitive skin, such as rosacea, by enhancing exfoliation and normalizing epidermal cell turnover. These effects help to reduce the papular symptoms of rosacea.